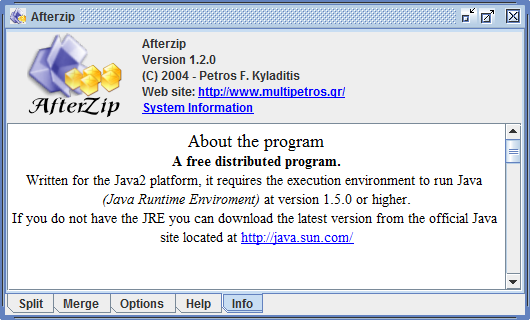 Afterzip is a a desktop program (uses Java Swing for UI) usefull for split and merge files. It was developed in 2003 and originaly distributed as Freeware. Now, 14 years later, the binary files rebuilded, the program repacked and the source code is released under the terms and conditions of the GNU GPL 3.